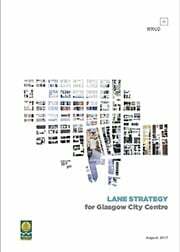 Glasgow City Council has approved the Lane Strategy that we developed with the City Centre Team in Development and Regeneration Services during 2016-17. The strategy for the city centre is guided by Glasgow City Council’s Getting Ahead of Change, Glasgow City Centre Strategy and Action Plan 2014–19. This document outlines the strategic vision for the city centre and a fundamental component of this and a key priority was the development and delivery of a city centre lane strategy. Our report describes the components of a comprehensive strategy for making the most of the city centre lanes by creating attractive and active lanes which help to foster a thriving civic life and promote economic growth, inclusion and sustainability. 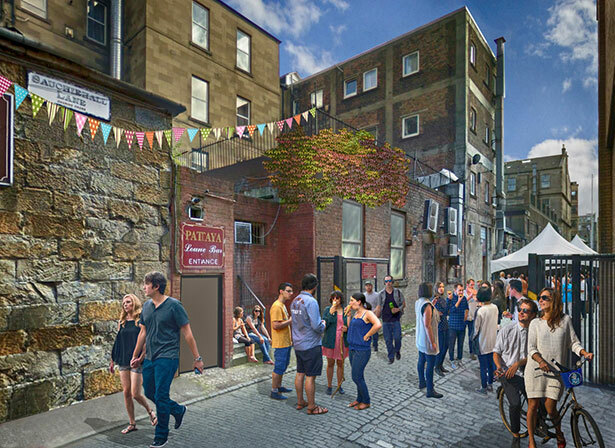 WHAT IS THE POTENTIAL OF GLASGOW’S LANES? 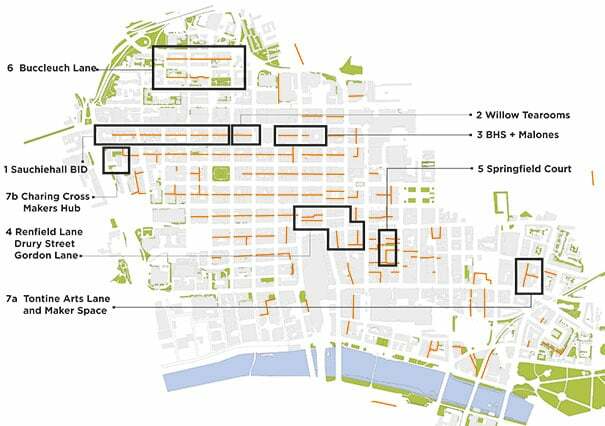 Glasgow has around 90 lanes in the City Centre Strategy area totalling approximately six miles in length (9.8 km). 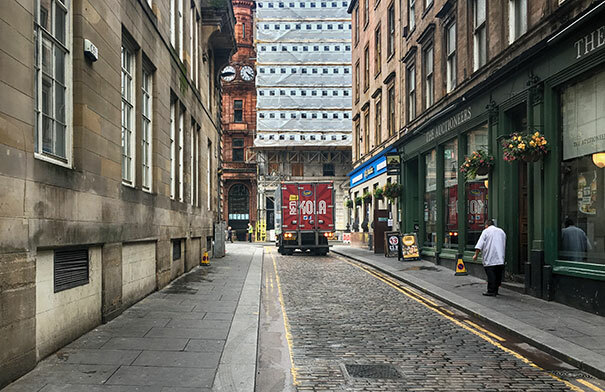 This system of lanes has developed over many centuries but most significantly over the past 300 years, spanning five important phases of city development which have left their mark on the character, current uses and potential of the lanes. Today almost the entire city centre is covered by the Central Conservation Area. The city centre also contains over 2,300 Listed Buildings, most of which are in the Conservation Area. There is a close correlation between the lanes and the distribution of Listed Buildings. This is a remarkable and rich heritage and arguably one of the best ways of appreciating it is through the lanes. While the current role of the city centre lanes can be seen as primarily utilitarian, a small number of lanes, such as Mitchell Lane and Virginia Court, are in active use on their own account and form part of the pedestrian network. At present these are the exceptions but the report identifies opportunities to unlock the latent potential of other lanes. The distribution of land uses in the city centre and the relationship with the character and condition of the lanes is marked. 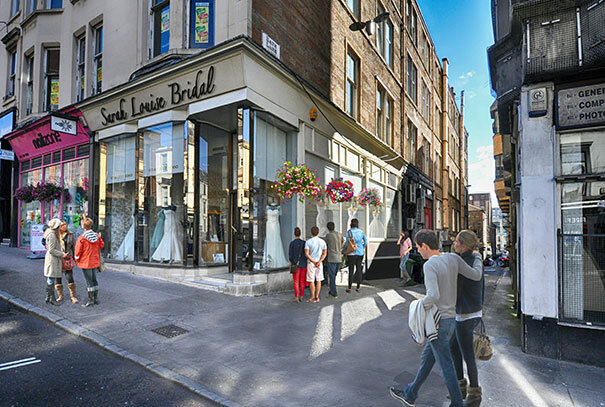 There is a direct relationship between lanes that service or back onto streets with high levels of café, restaurant and licenced premises and issues with refuse, waste and sometimes community safety, for example on Sauchiehall Lane and North Court Lane. At the same time, these lanes often represent some of the best opportunities for transformation through events and art interventions. In many countries, the often overlooked and uninviting lanes are shedding their image as merely functional spaces, embracing a new role of contributing to the urban environment. 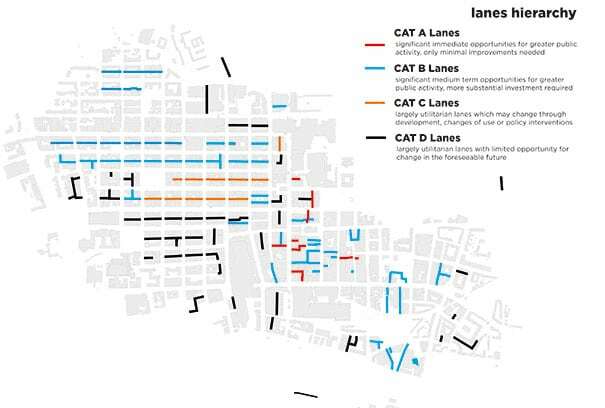 Recently, lanes have begun to be reintegrated into the fabric of cities in new ways. Some are being “greened” – renovating them to manage storm water and reduce urban heat island effects. Others are becoming part of the public realm either as vibrant pedestrian connections between streets or as destinations with activities and events. Cities across America, in Australia and Canada are beginning to activate their lanes in exciting and innovative ways and the report contains a sample collection of those cities involved in a range of different but successful lane projects. Some of the worthwhile lessons from these projects include the value of cities having a Lane Strategy, the importance of public safety, getting a balance between service functionality (deliveries, refuse collection etc) and pedestrian friendliness, providing appropriate facilities for users and supporting commercial activity. These are the fundamental areas for action covering the whole city centre to improve lanes and maximise their potential. They include waste and recycling, public health and community safety, lighting, parking and surfacing. They also include events and popups, arts and culture and integration with the ‘Avenues’ project (EIIPR) being funded under the City Deal. Possibly the most significant issue to be dealt with here is commercial waste disposal. There is a proliferation of bins in lanes throughout the city centre. Some lanes, such as North Court Lane and Gordon Lane, were overwhelmed by bins until the implementation of the Pilot Project which ran in parallel with our study. The problem is not simply one of poor appearance. The proliferation of externally-stored bins causes a range of public health and community safety problems including waste accumulating around bins, smell, vermin, antisocial or criminal behaviour screened by bins, including misuse of needles, rough sleeping in or around bins and fire-raising. Reducing the proliferations of bins, and knock-on environmental and antisocial problems, is a complicated challenge. The report proposes a range of actions including reduction of waste and recycling at source, education and training, timed windows for collection and a ban on bins in lanes. It was proposed that a demonstration project should be trialled within the city centre to test and refine the system. This has now taken place and the scheme is being rolled-out across the whole city centre and beyond. The report examines parking and surfacing in lanes. Many city centre lanes suffer from indiscriminate parking despite widespread parking restrictions throughout the city centre. A range of solutions are proposed that would remedy this including resurfacing and the introduction of Restricted Parking Zones. 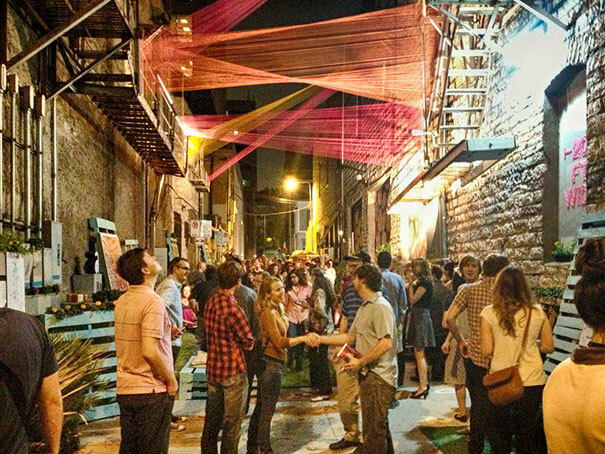 Events and popups are the simplest way of making more of the potential of lanes. More activity such as markets, gigs, shows, festivals and outside seating for cafes and bars helps to animate lanes and make them more attractive. Consultations with event organisers revealed barriers to organising more events and popups – for example, the cost associated with applications for street closures and slow or inconsistent decision-making on consents. The report suggests a range of approaches including putting in place a single, named positive point of contact as a source of advice for dealing with all consents and applications as well as proactively reaching out to landlords and potential operators of a range of lane premises, existing or potential. 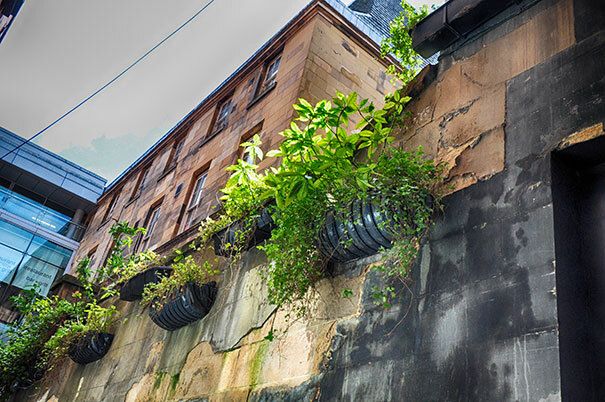 Glasgow is home to a rich and diverse artistic community, whose contribution to the city’s culture, community life and economy is well documented. Artists need space, for both studio and show: affordable and appropriate ‘studio’ space for production, and ‘show’ space from concert halls and galleries to outdoor spaces for performance and installations. The spaces provided by the city centre’s lanes are a huge resource for the city’s artists – for musical performance and visual arts installations, both temporary and permanent, and as productive spaces. The creative community of Glasgow effectively provides a ready-made tenant for the lanes: a network of people with the capacity and motivation to transform city centre lanes into active and productive spaces. The report proposes developing a pilot lane for productive studio and exhibition spaces, the development of an arts lane, broadening the scope of arts interventions beyond murals as well as conserving and building on the legacy of public art in the city centre. Finally, running an annual competition for artistic interventions in lanes with an independent jury (as in Sydney for example), linking to the proposed Lanes Activation Fund. Managing the future development and the use of buildings adjacent to lanes is an important element of this strategy. The design of buildings and their uses influence many important factors that are central to the aspirations set out in previous chapters of this strategy. These aspirations include opportunities for low cost employment space, ground floor uses that animate the lanes, lighting that helps security, easy to maintain surfaces, vehicle access and parking, the retention of historic features and art interventions. Provisions for waste and recycling management, microclimate and shelter together with sustainable drainage systems were also considered to be important factors. New planning policy and guidance is proposed for the creation of active frontages and spaces opening on to lanes. It sets out arrangements for communal systems for waste presentation and collection – including recycling, security, lighting and maintenance. In addition, there are recommendations for public access to lanes (rather than full or partial closure) and for the retention of built heritage features such as cobbled surfaces, glazed tiles, the restoration of bricked up windows facing onto lanes and the repair of small features such as cast iron kerbs, ironwork and railings. To ensure that this strategy brings projects into being, a number of demonstration projects have emerged through engagement with businesses, entrepreneurs and community groups. Individually, these projects are opportunities to demonstrate how specific aspects of the lane strategy could be implemented and the impacts they could have. Collectively, the projects should be seen as an opportunity for the City Council and other stakeholders to promote the potential of the lanes and encourage more activity and investment. The projects outlined in this section are a selection of ideas and proposals that emerged during engagement on the lane strategy, focusing on lanes which present the greatest opportunity for positive change. They seek to illustrate the range of themes covered by the strategy. The City Council has agreed to set up a Lanes Activation Fund which will be an important stimulus for animating the city centre’s lanes. The Fund will include competitions, rewards and incentives to encourage creative initiatives that contribute to the implementation of this Strategy. The priority areas where some of these actions can play out vary considerably. Some, for example, effective planning policy and guidance or resolving operational issues around waste, parking and lighting cover the entire city centre while others are site specific. The Lanes are potentially one of the most significant and useful assets within Glasgow City Centre. They offer a very different experience to the busy main streets in terms of scale and shelter. They potentially offer opportunities for art and culture, for employment through cheaper spaces for small businesses to develop, for spaces to make things, places to perform, to eat and drink. They are rich in history and architecture. Much of the work in preparing this strategy has been carried out in discussion with a wide range of agencies, communities, artists, entrepreneurs and businesses throughout the city centre as well as departments within the Council and its contractors. There have been many positive outcomes from these discussions and we hope that these will be implemented in the near future.